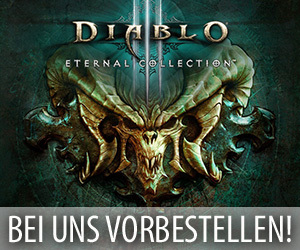 Update: Nachdem der weiter unten vorgestellte Artikel der Entwickler vor Kurzem bereits drei neue Karten aus Hearthstones kommender Erweiterung „Die Straßen von Gadgetzan“ enthüllte, haben die Mitarbeiter der Internetseite ign.com und der bekannte Streamer Reynad im Verlauf des heutigen Abends interessanterweise auch noch zwei weitere neue Karten aus diesem Set vorgestellt. 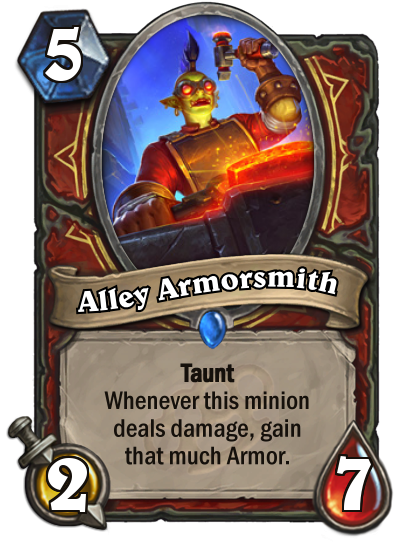 Dabei enthüllte Reynad dann die seltene Kriegerkarte „Alley Armorsmith“ in einem seiner Videos auf YouTube und die für ign verantwortlichen Personen durften den für Krieger, Paladine und Jäger bestimmten neutralen Diener „Grimestreet Smuggler“ in einem ihrer Artikel präsentieren. Heute Abend haben die Mitarbeiter von Blizzard Entertainment einen neuen Blogeintrag auf der offiziellen Communityseite von Hearthstone: Heroes of Warcraft veröffentlicht, der den Spielern die in der Erweiterung „Die Straßen von Gadgetzan“ enthaltene Familie der „Grimy Goons“ ein wenig näher bringen soll. Dabei beschreibt dieser Artikel der Entwickler dann allerdings nicht nur die Hintergrundgeschichte dieser aus Kriegern, Jägern und Paladinen bestehenden Fraktion, sondern er stellte auch noch insgesamt drei komplett neue Karten vor, die mit dem nächsten Addon ihren Weg auf die Liveserver finden werden. Welcome to Grimestreet, kid. We heard you was lookin’ for a family to join, so you just walked down the right alley. 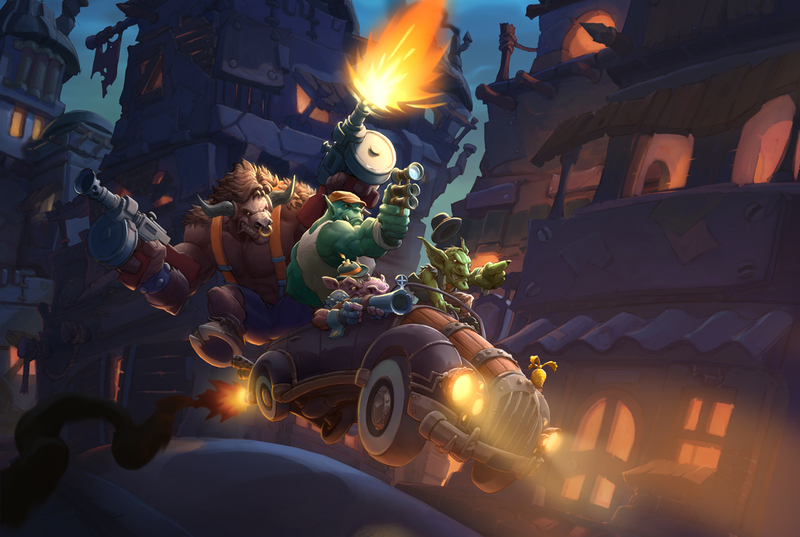 We’re the Grimy Goons, the toughest family in Gadgetzan, and we’re gonna be the ones who own this town. Now, cool your heels, and I’ll give you the rundown. First, our illustrious leader, da two-headed ogre Don Han’Cho. Han is a criminal mastermind—a real genius—and Cho? Well, Cho isn’t the sharpest axe in the armory, but he hits like a runaway kodo. More like a stampede of runaway kodos. Maybe you’ve heard dat two-headed ogres got some serious magical chops, but not Don Han’Cho. The Don don’t need magic cuz he’s got us, da Grimy Goons. We done real good for him too, what with all the robbin’, extortin’, blackmailin’—y’know all the good crimes. Not to mention our speciality: arms smugglin’. You might think Don Han’Cho has it all: he just bought the First Bank of Gadgetzan, he takes a cut from da loot fenced at da Gadgetzan Emporium, and he’s got a tight grip on the whole Grimestreet neighborhood. Believe me, Grimestreet is just the beginning, my friend. 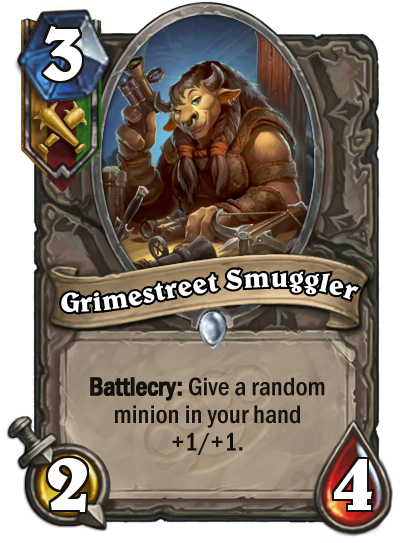 Don Han’Cho is preparin’ for a hostile takeover of Gadgetzan, so he’s been recruiting new Goons non-stop and stockpiling weapons like you wouldn’t believe. Now he’s got the most muscle, and arsenals stashed down every side-street and bolt-hole in dis town. 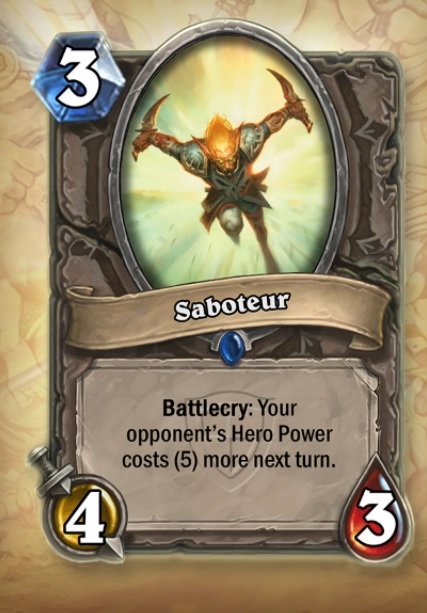 When da coin drops, you know the Grimy Goons are gonna be ready. Dis is my favorite part of being a Goon! We get the guns. And when I say guns, I mean the BIG guns, includin’ some very choice engineering. Grapplehammer is a talented guy, and his people dole out upgraded gear through the city’s pawn shops. It’s not just hardware neither; we also got access to some pretty scary beasts from da Arena! Basically, Goons stick together and we got all the best toys, so you ain’t never gonna get into a fight without some back up. Even the littlest guy can be a heavy hitter with the right pea-shooter in da violin case. Us Goons always try to smuggle in some hardware before we get into a brawl. So, here’s how that works. 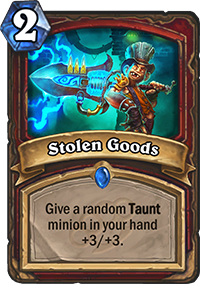 When a fellow Goon is played, they’ll make arrangements for their back-up to get some of the weapons we stashed in Gadgetzan. 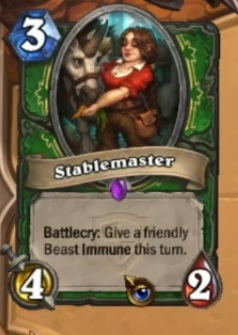 That can come in the shape of some very beefy buffs to the minions in your hand. Just wait ‘til you get a load of the goods in Don Han’Cho’s private stash! Not just any joe-schmoe or jane-schmane can be a Grimy Goon, kid. You tough? Can you handle yourself in a stand-up fight? Good. You gotta know your way around weapons too, since that’s the edge (heh, see what I did there?) we got against the jerks who are trying to take OUR city. Having a sense of style is a plus. Think hats, vests, pinstripes, suspenders—that kind of thing. It’s not mandatory, but it’ll help keep you from gettin’ ventilated once the lead starts to fly, and you’ll look good doin’ it. Hunters are amazin’ shots, and you ain’t never met an enforcer like an angry Paladin. They make sure everybody on Grimestreet follows da rules. Our rules. 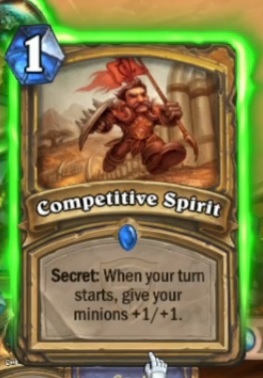 The bottom line for you is that some cards got the Grimy Goons symbol on ‘em right under the mana cost. Looks like a couple of spiked clubs. 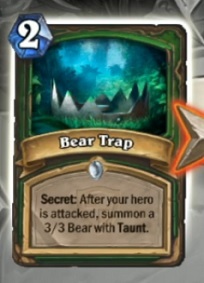 If a card got the sign, you can stick it in a Hunter, Warrior, OR Paladin deck. Pretty swell, huh? Word on the street is that the other guys, the loony Kabal potion-leggers and those sneaky Jade Lotus weasels*, will probably send a recruiter your way. Dat’s fine—hear them out, then you forget all about ‘em and come back to us. We’ll take good care of you. Goons gotta stick together, right? 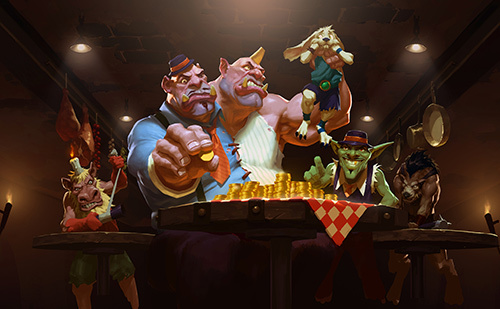 Get the low down on what’s happening on the Mean Streets of Gadgetzan on da official site. 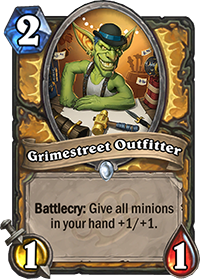 And don’t forget to stockpile your own arsenal and get ready to hit the streets by pre-purchasing a bundle of Mean Streets of Gadgetzan cards! 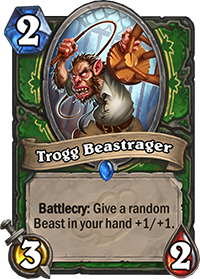 Speaking of, you can see all of the new Mean Streets of Gadgetzan cards as they’re revealed on dat book face thing, or whateva it is.